Home » If You Own a Mountain Bike You Must Buy a Chain Tool! If You Own a Mountain Bike You Must Buy a Chain Tool! Why using a chain tool is essential when you own a mountain bike? There are certain pieces of equipment with which every mountain bike rider should travel wherever they go with their bike. And one of these is the mountain bike chain tool! When your mountain bike chain is damaged, you need to replace it as soon as possible with a new one. However, if your chain breaks while you’re on a trail, you can give it a quick repair job with a mountain bike chain tool. That’s why most experienced mountain bikers make sure to travel with one of these very important and essential tools. They are just so useful that you really cannot bike without one. See few more important tools in Turbolts. A chain tool for mountain bikes comes with three main parts: the metal side plates, the rollers that rest between these plates and the rivets or pins that go through the rollers. Thanks to these rivets, the rollers can turn freely as the chain moves around your mountain bike’s cogs. When you’re out in the hills, or wherever, mountain biking and your chain breaks, the quick solution is to remove the broken chain link and reattach the two ends of the broken chain. Then you can ride on a shorter chain until you buy a replacement. 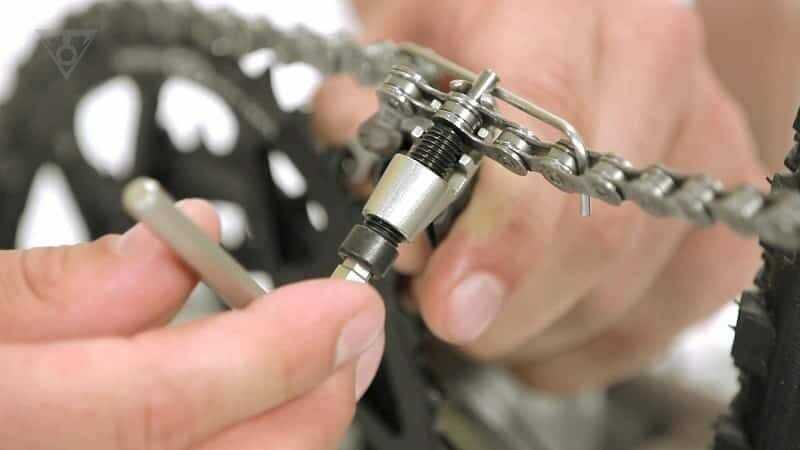 Chain tools make it easy to remove broken links on the chains of all mountain bikes. First, place the broken chain link in the bike chain tool. Next, turn the tool counterclockwise until the rivet pin of the chain tool touches the chain rivet. You can continue turning until the pin moves out of the roller. Turn the chain tool in the other direction and pull it out of the roller. You can then move the chain gently side to side until the you can remove the inner side plates and roller. When you do all this for the first time, just take your time and get it right. Once done you will always know what to do and using a chain tools will become much quicker. Once this is done, you just have to re-route the chain through your bike and insert a new link or connect existing links together to make a shorter mountain bike chain. Easy really – but, practice makes perfect.